To make an appointment for a consultation for your neck pain call our office at 732-365-0301 today. Nearly two-thirds of the American population will experience neck pain at some point in their lives. Did you know that it is the third most common type of pain suffered in this country. * Neck pain can become severe enough to interfere with everyday activities and make basic movements (such as sitting or turning the head) impossible. As you can see by our patient in this video; neck pain doesn’t have to be part of your everyday life. For a FREE consultation so we can assess the symptoms and develop a treatment plan utilizing the best disciplinary approach suited to your situation, call us at 732-365-0301 or fill out a form to schedule an appointment on our website. Physicians that are specialists in Physical Medicine and Rehabilitation (Physiatrists) are an excellent option for those suffering from neck pain. Physiatrists provide a non-surgical, moderate, and effective approach that helps neck pain patients avoid unnecessary, aggressive, and often expensive pain management strategies. They can also help patients seeking to avoid the damaging use of both over-the-counter and prescription painkillers. Physiatrists often act as the head of a team of pain management practitioners. At Monmouth Pain & Rehabilitation, our Medical Director oversees a number of pain management techniques. When visiting our office for Neck Pain in Shrewsbury, Freehold, Wall, or Lacey NJ we provide a full diagnostic process, a comprehensive pain management plan is customized for each patient that may include physical therapy, Spinal Decompression Tractions; chiropractic; and acupuncture. In some cases, neck pain is so severe that patients are unable to participate in physical therapy or other rehabilitative practices. In this case, Physiatrists may recommend the use of spinal injections. The purpose of this tactic is to end the cycle of pain and inflammation that is impeding the body’s natural ability to heal. Some injections, in particular Epidural Steroid Injections, are performed with the use of a Fluoroscope, imaging technology that allows the doctor to view the affected body part in real time. The Fluoroscope is used to guide the needle into the proper position before the injection is given. This practice increases the effectiveness and precision of Epidural Steroid Injections, which are generally used for any type of disorder in which pain is caused by the inflammation of spinal nerves. Trigger Point Injections are also used for neck pain relief. This is an injection of an anesthetic/cortisone combination that may be given in the muscles, ligaments, or other soft tissues of the spine. 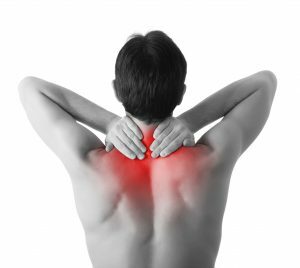 Trigger Point Injections help to alleviate muscles spasms that are sometimes the cause of neck pain. Neck pain patients at our facility may receive any of the above treatments during the pain management and rehabilitation process. Our mission is to treat your pain condition with the safest, healthiest, and most conservative approach possible to minimize damage to the body. We help neck pain patients avoid surgery and drug use, both of which place serious stress on the body. In addition to Epidural Steroid Injections, our Medical Doctor (Physiatrist) performs Facet Injections; Sacroiliac Joint Injections; Radiofrequency Ablation, and Peripheral Joint Injections. Our office also incorporates Ultrasound technology for more accurate diagnoses and, in some cases, guidance for injections. Please contact us to learn more about conservative medical treatment for neck pain in Monmouth County, NJ.